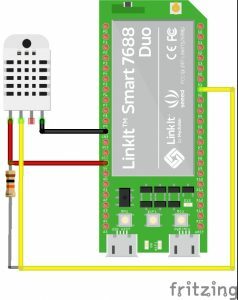 Both the Linkit 7688 and DHT22 are low cost components and can perfectly be used as a IOT temperature and humidity device. Using the openwrt part of the linkit to upload all the data to your server. You can ignore pin 3, its not used. Please use a pull-up resistor between VCC and the data pin (10k). Below pictures shows the connection diagram. You can use the following sourcecode written by layada. If you download the libraries you can also get the code from the example menu. With the arduino ide 1.6.9 you will receive a compile error “magic key not defined”. You can download and use the hourly builds to solve this issue.